Betty Romer has been retreating to Century Village, a senior citizen community in Florida, for about 7 years. That is where she met her current boyfriend, Sid. Betty is 78ish and Sid is a little older. Betty is but one of many senior citizens taking full advantage of their latter years and reaping the benefits of eating well, exercising, social awareness, genetic predisposition or just preserving a healthy state of mind. They are pushing the limits on longevity. The more Betty works out and plays, the younger and more alive she feels. The photographs on these pages were taken in New York at city health clubs and gyms, but the trend is nationwide. Many of the subjects here spend their summers in New York and winters in Florida. Fitness training, awareness and health consciousness has grown in America in line with an expanding elderly population. 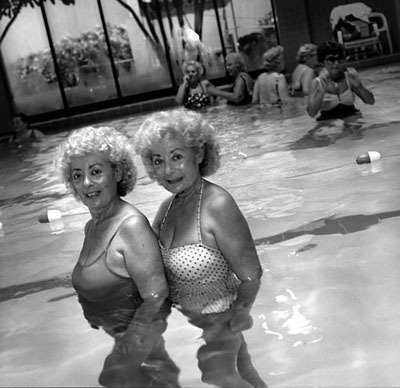 Above: Twins Helen Fox and Miriam Lehrer (r.) enjoy water ballet at Asphalt Green aerobics and pool club in Manhattan. Pages: 1. 2. 3. 4. 5.